Bio-Serv has some pretty unique treats for primates and while not every monkey loves every treat, they’ve got plenty of different treats so one of them could be your monkey’s favorite! The great thing about their treats is that they’re nutritional complete and that nearly all of them have vitamin D3 in them which is very important especially for new world primates. This blog isn’t so much about their treats but more about their enrichment devices. We’ve tested out 3 of them with our capuchin so let’s find out together if these enrichment devices are worth their asking price. Shown on the left, the tuff turf foraging board is a board which you attach on the outside of your cage. You simply put treats on it like crumbled nuts, seeds, dried meal worms, or you can of course also buy the foraging crumbles made available by Bio-Serv. The small board (which is the one we bought) costs $47.95 and is worth every penny. Thanks to the very durable artificial turf, foraging time will be extended for a long time. This stainless steel board is made to last and extra replacement pads are available. Shown on the right, the Shake-a-treat holder gets filled up with small treats like Supreme Mini Treats which are sold by Bio-Serv. We weren’t very impressed with this device since it takes our capuchin basically seconds to get these treats to fall from the top layer to the bottom layer by shaking the device. The goal of enrichment devices is to keep a primate busy for a while and this device simply didn’t accomplish that task. Shake-a-treat is available on bio-serv.com for $40.80. 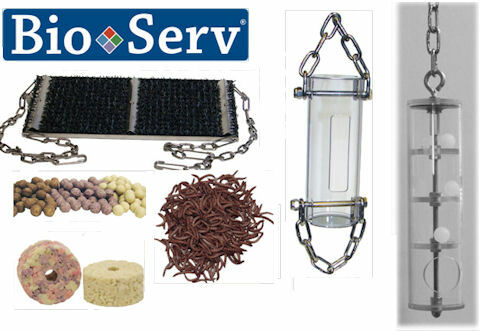 Shown in the middle, the crumble disk holder from Bio-Serv is made to last. You simply put a crumble disk into the crumble disk holder and your primate should be able to keep themselves busy for a very long time. Sounds like the perfect enrichment device right? To test this out, we purchased the mixed fruit flavored crumble disks. Now I don’t know if they were stale or if this was normal but these crumble disks were so hard that the only way you could get a piece of these crumble disks was by using a knife and even then it was very hard to crumble pieces of a disk. After weeks of licking this block it seems our capuchin did sometimes manage to get a piece from this crumble disk. One day while walking by I noticed that he stuck his hand into the device and that he seemed to have a hard time getting it out. A few seconds later all hell broke loose because he was indeed stuck. Our capuchin started to freak out and ended up dangling down from this device since he couldn’t get his hand loose. I had to rush into the cage to lift him up and work with him for a while to get his hand loose again. I contacted Bio-Serv to warn them about the potential dangers of this device and was informed that I was the first one ever to complain about this enrichment unit. Even if this event wouldn’t have occurred I would still classify this enrichment device under the “ugly” category simply because the crumble disks were way too hard and therefore there wasn’t really much enrichment going on. We bought the Fruit flavored crumble disks for $53 and the crumble disk holder for $40.80.